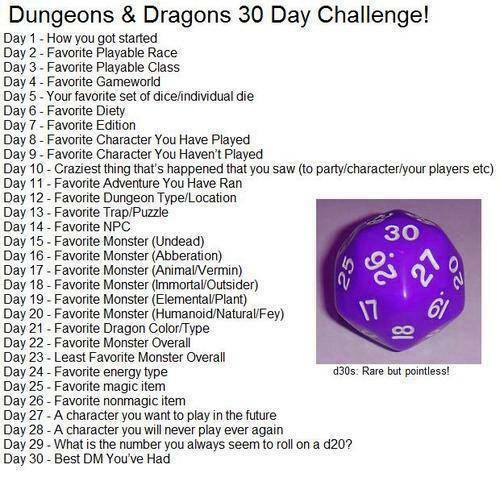 Honestly I got started with Dungeons & Dragons with the cartoon and arcade games from the 80s. The actual roleplaying game, however, came about in AIT (Advanced Individual Training) back in 1999. The PX had a single copy of the Basic Game Boxset (with Dice) for $30.00. I shared a room with 3 other guys in the barracks and we had just passed our I5 which allowed us to have personal items. Bored and sick with the post bowling alley and movie theatre I picked it up. We played several times, but eventually I was the only one left "wanting more". I spent the rest of AIT bugging anyone I could in the day room to play and usually ended up in long games of Risk instead. Dwarf and Goliath are my favorites. I have always been a Tolkien and Swords & Sorcery fan and both races represent both styles to me. The Goliath is the noble savage of Conan (only bigger) and the dwarf is the proud, noble warrior culture who is slowly fading from the world. This is hard, I have played so many. I think it would be easier to say that with the exception of bards I prefer not to play any arcane spellcaster class. I would like to say any caster, but I enjoy playing clerics and Paladins (especially when I play a dwarf). IN fact I would say that ninety percent of the time I am either a Dwarven Cleric or Paladin. The rest of the time I juggle between Goliath barbarians and human bards (only time I play female). Hmmm ... Interesting question. I prefer the Forgotten Realms in terms of story and lore, however, I hate playing in the Realms because it feels too much like treading over ground others have already tread. Eberron, I enjoy the concept and the Warforged, however, again the world does not seem like a place of wonder for me. I think in the end, my favorite game world was a Viking/Northern Europe game world called Stoneheart that I was part of a year ago. The world was so full of mystery to me and it was a joy to discover the past and ancient war that was influencing the game I was in. 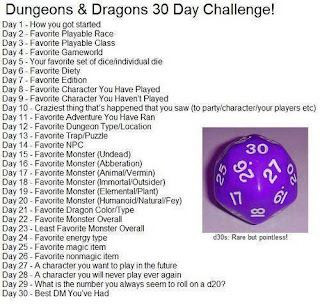 Of a more official sort I would say that I love Mystara and a lot of my games are set in a Mystara that is a mix of the setting and the Capcom video games (S'ynn the Dragon was a real threat and the Dutchy is still in mortal straits because of her actions).